-- Please Select --Infant 60" x 55"Child 80" x 55"
Losing a child is never easy. Matthew F. Sheehan extends their heartfelt sympathy to the loved ones left behind while helping to make final preparations a little bit easier for the family by offering beautiful White with Butterflies Child Size Funeral Palls in your choice of 2 sizes. The funeral pall covers the casket during the memorial or funeral service. The meticulously tailored funeral pall is unlined with rounded corners and finished bias tape hems. It is made from the finest quality cotton fabric and is available in 2 sizes: Child (80 inches long by 55 inches wide) or Infant (60 inches long by 55 inches wide). 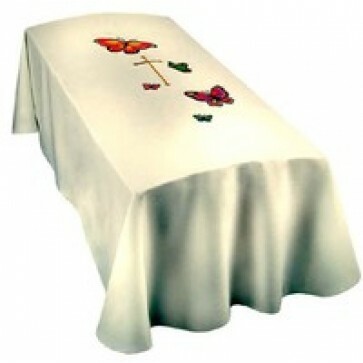 The White with Butterflies Child Size Funeral Pall may be personalized with the addition of a memorial label. Memorial labels may be printed with up to 3 lines of text.